Fridge0 Refrigeration offers same day LG fridge repairs throughout Melbourne's Eastern and South Eastern suburbs with no call out fee! We repair and service all makes of LG refrigerators. 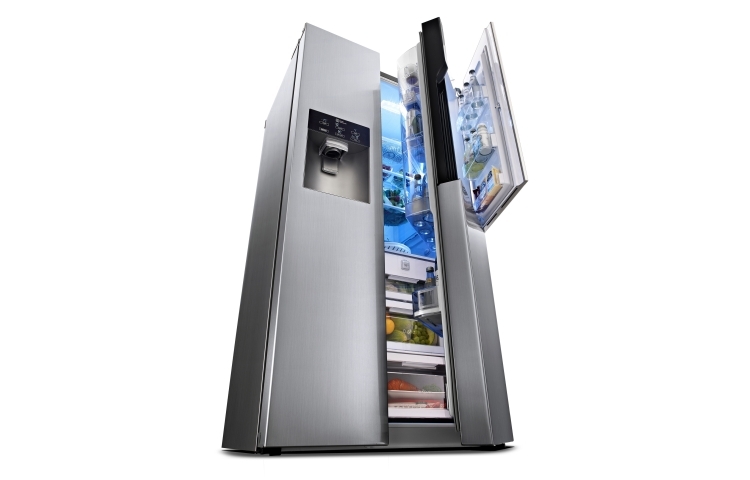 LG fridges offer a vast range of models from bar fridges/freezers to side-by-side, French door, upside down/bottom mount, upright, pigeon pair fridge and freezer, four-door fridge freezers and many other integrated models. We service them all. The most common fault or issue that is noticed first off is that the freezer seems to be working OK but the refrigerator section doesn’t seem to be cooling as well as it used to. There are multiple reasons why this occurs. One of which is a faulty evaporator fan located inside the freezer compartment which normally drives the cold air from the freezer down to the fridge section. By making sure that the fridge compressor is running, one can hold in the freezer door switch and listen for a fan noise or feel for cold air flow to confirm a possible fault with the fan. If the fan is not running one has to see if there is voltage getting to the fan with a multimeter. If there is power getting to your fan and it is not running, it is faulty - time to call a fridge mechanic! If the fan is running but the cold air isn’t getting to the fridge compartment then you most likely have an ice blockage either caused by a blocked drain or the fridge is not doing it’s 4-6 hour defrost cycle. The first thing to check is the evaporator coil located at the back of the freezer. If the freezer coil is clean and not caked with ice then most likely it is a blocked drain issue which generally can be sorted out by switching the refrigerator off at the wall for at least 3-4 days preferably in a warm room to let all the internal ducts of the fridge to thaw out. Next, the drain at the back of the refrigerator needs to be checked for blockages (usually a rubber or plastic tube next to the compressor or condenser coil coming from the cabinet going into a tray). If the drain is unblocked and the fridge has been defrosted, that tray should be overfilled with water. Once that is all checked one should tilt the fridge back just to make sure no defrosted water has been left in the ducts to refreeze and start causing issues again. If it is not a blocked drain and the evaporator coil is covered in ice then the refrigerator is not doing it’s defrost cycle which can be caused by many factors. The most common reason is a faulty heating element. This part sits under the evaporator coil and is turned on every 4-6 hours to melt any access ice to keep the coil clean and running efficiently. If the heating element checks out OK, and all the other components that are connected inline with the heating element are OK as well, then most likely (if the refrigerator has electronics) the main board is faulty. If it is a non-electronic fridge then the timer is faulty. to clean out all the ice. If there is no ice on the fan and it spins freely, then most likely the fan is faulty and needs to be replaced. Side-by-side LG refrigerators have the same problem with icing up. If your LG fridge is tripping the safety switch, the most common issue is the defrost heater element. Without any tools, the only way to test if it is the heating element (or any other component that is suspected to be causing the issue) is to disconnected it and turn on the refrigerator. But only if your house has been updated with safety switches and RCDs. If your house is still wired up to the old wire/ceramic fuses then do not attempt the above. Even if you have the more recent updated safety switches, I do not recommend this technique because you could cause more damage (for example, to the mainboard) if you keep setting off the circuit breaker. In this situation, you need to call a qualified technician. The second most common issue when dealing with the refrigerator tripping the safety switch is the compressor /motor being faulty.